Happy birthday to Avi (Nothing But the Truth, The True Confessions of Charlotte Doyle), Tanya Lee Stone (Almost Astronauts), and Erick Ingraham (Hot-Air Henry). It’s the birth date of Otto Soglow (1900–1975), cofounder of the National Cartoonist Society, and creator of the long-running comic strip The Little King, which appeared in The New Yorker. A few royal birthdays today: Natal anniversary greetings go to Akihito, the Emperor of Japan, and Queen of Sweden Silvia Sommerlath. Read The Birthday Ball by Lois Lowry, illustrated by Jules Feiffer. It’s Festivus, a secular holiday introduced to popular culture by screenwriter Daniel O’Keefe, on the television show Seinfeld. One feature of this invented holiday is “The Airing of the Grievances.” Though not a children’s book per se, you may want to read Festivus: The Holiday for the Rest of Us by Allen Salkin. When this time of year comes around, I always think of one of my favorite books first published in 1978, which truly captures the joy of playing in the snow. 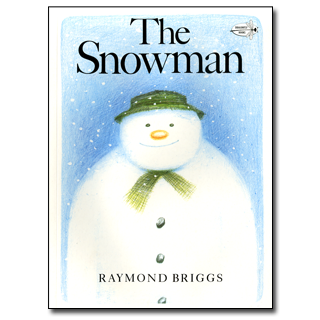 Although comic-book format picture books and graphic novels rule today, when Raymond Briggs used the wordless, comic-book format in The Snowman, he broke with the tradition of his time. However, the result was so magical than even adults who might have shunned comic books found themselves in love with his story. In a book that works for preschoolers and those up to ten, a little boy awakes to find a snow-filled landscape and then goes out to build a snowman. But when the boy checks on his creation that night, it has come alive and tips its hat to the boy. Then the snowman enters the house, plays with the boy, and shares a meal with him. Finally, the two set off together on a magical flight that takes them over land and sea. In the morning, the boy goes out to find a melted snowman, an ending tinged with melancholy and loss. As a boy, Raymond Briggs had always wanted to be a cartoonist. At fifteen, to pursue this dream, he became a student at the Wimbledon School of Art in London. Like other art students of the era, he received training in classical nineteenth-century composition, still-life and figure drawing. Eventually, he decided that he did not want to become a painter. However, when he finally returned to his childhood dream of making a comic book, he was able to bring all of his skills in draftsmanship, composition, and anatomy to The Snowman. Although the landscape seems exotic, Briggs used his own home and garden in Sussex, at the foot of the South Downs, a few miles from Brighton. The snowman flies over the Downs to Brighton, and then the Royal Palace. Since Briggs wanted a feeling of childlike spontaneity in the drawings, he worked in pencil crayons to prepare the art. This media created a book with soft color, almost as if every page has been muted by the fallen snow. The Snowman draws on the power of a persistent childhood fantasy—what if the snowman a child is building could come alive. This completely satisfying and moving book was adapted quite successfully as an animated film often shown on television during the holidays. As I checked this book out of the library recently, one young woman ran over and exclaimed, “I loved that book when I was a child!” Children still do. 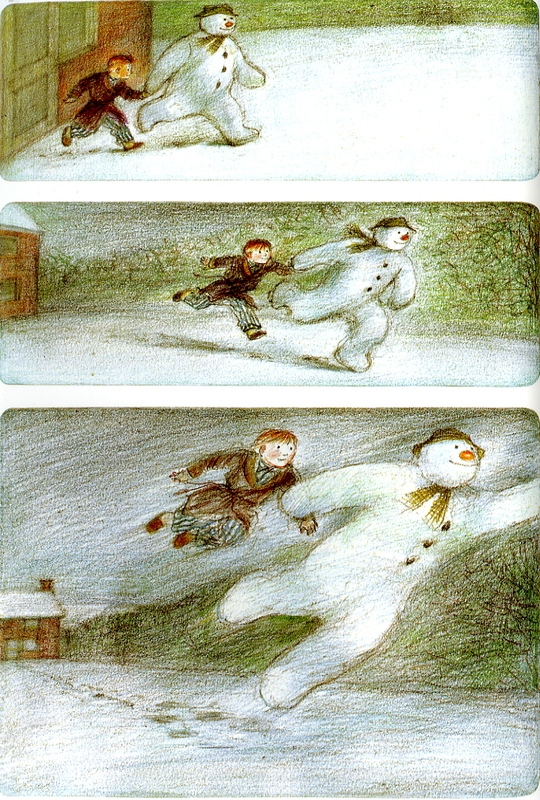 In The Snowman Raymond Briggs demonstrated how art alone, without any text, can convey a story that children delight in and remember. Originally posted December 23, 2010. Updated for . I discovered The Snowman almost immediately when it was published, and over time owned and given away a number of copies. It’s a tradition every year for this grown-up boy, and I’ve just about worn out the DVD version by Sony which contains one song, “Walking In the Air” I have to hear that song at least a few times each holiday season. Happy holidays to you. Nice to have your comments from both years! Thank you, Anita, this will be my next read aloud after break. This was a favorite of mine as a child–the book and the animated film–that I had forgotten until I read your blurb today. Thank you for reminding me of a great Christmas memory from childhood! Great book. A favourite of mine! I see the movie with my kids every Holiday season!